While stationed on Okinawa I had two opportunities to visit the main islands of Japan. I took one short TDY assignment to Itazuke AB outside of Fukuoka on the island of Kyushu, and week's leave in Tokyo. Unfortunately I took few pictures of these visits, and only a portion of the those have survived. On the left and below is the Meiji Shrine and park in the center of Tokyo. The Meiji dynasty was one that bridged Japan from its isolated feudal society to the world power whose aspirations resulted in WW II. On the left is the Frank Lloyd Wright designed Imperial Hotel. An architectural and engineering masterpiece. It was one of the few major structures to survive the 1923 earthquake. It didn't survive another year after this picture was taken and it was torn down in 1967. 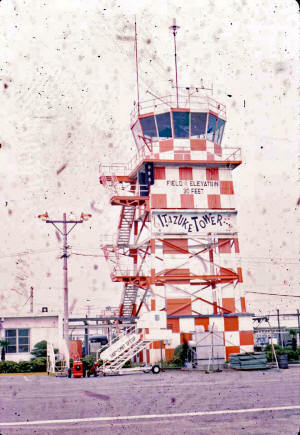 I guess I should have waited till the landing was OK'd"
According to Harrel Lamkin, the author of Itazuke Tower was W.F. McCrystal, Jr, an Air Force pilot who died in 2002. The infamous Itazuke Tower was the subject of the 2nd most famous Air Force song (next to that pretentious thing you hear when TV stations sign off about touching the face of God). This song I believe originated before or during the Korean War and was a darkly humorous reflection of the personnel schism in the Air Force where the bulk of the combat personnel are officers (pilots) supported by enlisted technical personnel on the ground (and a few technical officers such as myself). Obviously the song was written by a pilot. I first heard this song as a teenager in the 1950s on the Oscar Brand "The Wild Blue Yonder" recording. Oscar Brand was one of my favorite folk singers at the time, primarily because he recorded dirty songs with the appropriate lyrics (e.g., "Bawdy Songs and Backroom Ballads"). Whenever I feel myself getting wrapped up in some general public frenzy on the evils of a strong military I reflect on our military that would decorate one of its building to celebrate an irreverent song that poked fun at its rigid procedures and priorities. In that light, the Air Force doesn't seem such a threat. Then again I remember that the Air Force at that time was lead by Curtis LeMay. Now that was a scary guy. I spent a few days at Itazuke on TDY from Naha AB with a detachment of F102s. We were deployed to Itazuke to conduct a training exercise with the Japan Air Self Defense Force (JASDF) forces. On the left and to the right are pictures of the F102s on take-off from Itazuke, returning to Naha.